Presented here is the crown jewel of the '17-18 National Treasures production and the single most important rookie card of the 3rd overall draft pick. 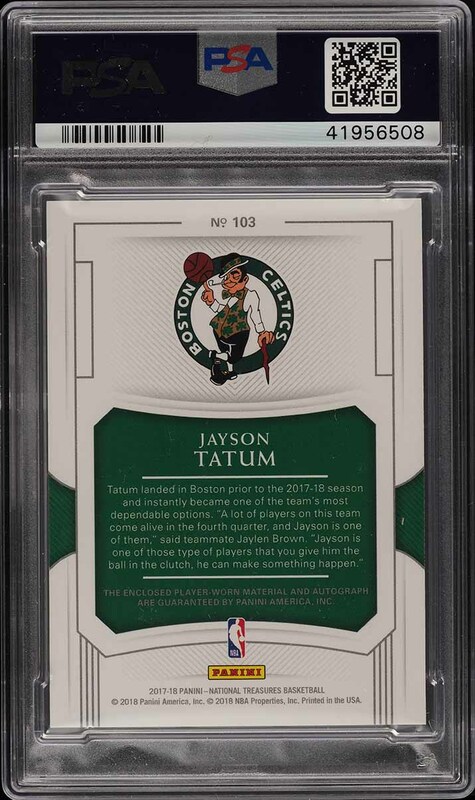 After a stellar showing in the playoffs one year ago, Tatum's brand took a massive leap forward and is now one of the most invested in young athletes to date. 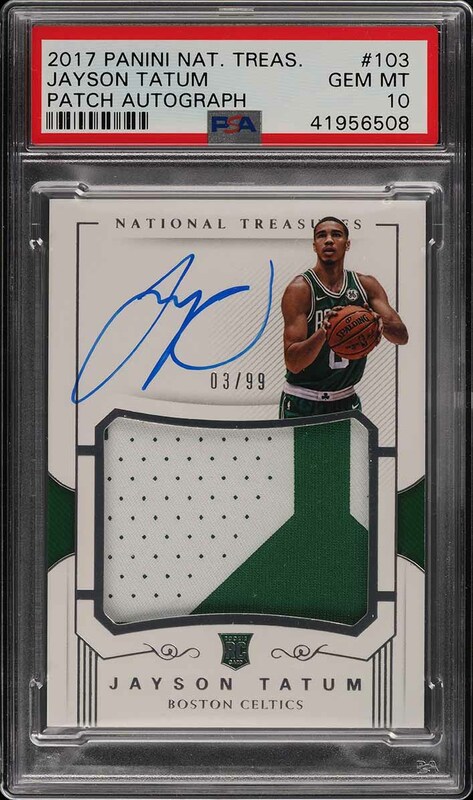 Currently #7 on the All-NBA jersey sales list, as well as being a member of the Nike family, the future for Tatum looks extremely bright and should be on every investors radar. What we have here is a perfectly preserved, undeniably GEM MINT example of this young man's preeminent rookie card. One of only 99 copies ever made, this card is far too rare to ever satisfy the demand. The card is pack fresh with untouched corners and smooth edges around. Shows stark white borders along with perfect framing and precise registration. The surfaces are exquisite and void of any indentations or imperfections. In addition, the autograph is boldly struck in blue ink and the jersey swatch is a desirable 2-color examples. All told, Tatum is among the best talents in the NBA and is an all-around phenom who's proven to be able to handle big pressure moments. When seeking a blue-chip modern investment commodity which has a high ROI possibility; look no further. This is an all around stunner which comes highly recommended by PWCC. One of nearly 15,000 cards, lots, and sets up for bid in our 4th Auction of 2019. Click on the link above to view the other PWCC auction lots. The PWCC Vault is now live! Open a PWCC Vault account and receive a custom Vault shipping address. Purchases shipped to the Vault receive free shipping and reflect Oregon's 0% sales tax rate.